Have you ever lost all data from your flash drive? With Flash Drive Backup you can automatically backup your USB drives and flash memory cards to the hard disk. Plug in, select, activate automatic backups, that’s it! 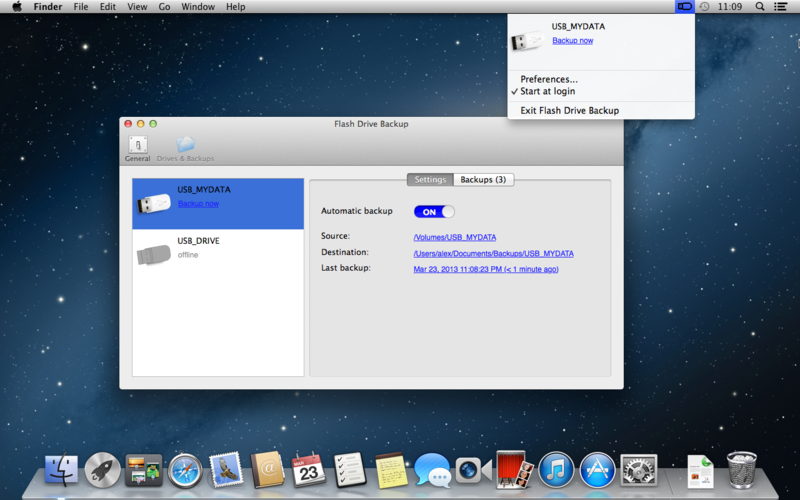 • Flash Drive Backup is designed to automatically backup your USB drives to your Mac. 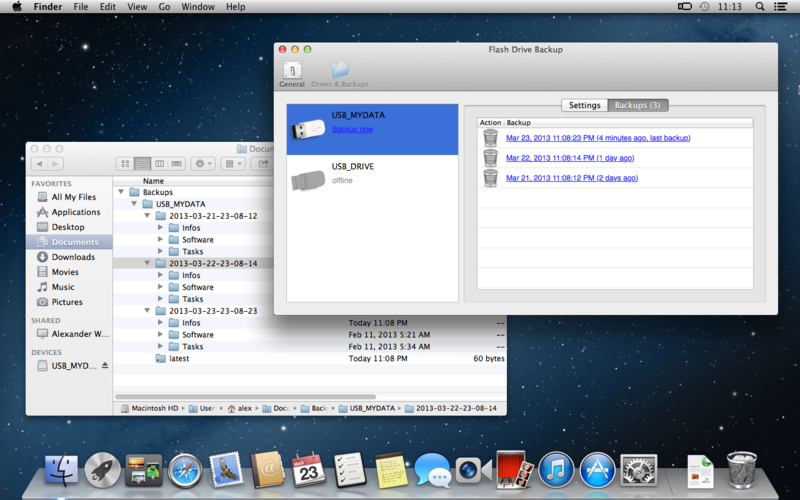 • Flash Drive Backup creates a complete copy of your USB drive content at every backup run. In case of USB drive failure you can move the backup to a new drive. • You can backup the entire drive or just a certain folder. • You can customize the backup intervals and the number of backups to keep. • You can search the backups with spotlight. You need a disk image as destination for backups. You can download an image here. If you decide to download one, just unzip it and continue with step 2. You can easily create one. Open Disk Utility, choose File>New Image>Blank Image... Choose Image Format: sparse bundle disk image, Format: OS X Extended (Journaled), Size: e.g. 100 GB, Name:FlashDriveBackupContainer, Save As:FlashDriveBackupContainer. Done! Move the image to the final place, before Flash Drive Backup begins to use it. It can be somewhere on the internal drive (so Time Machine can make backups of it) or an external/network drive (to save space on the internal one). 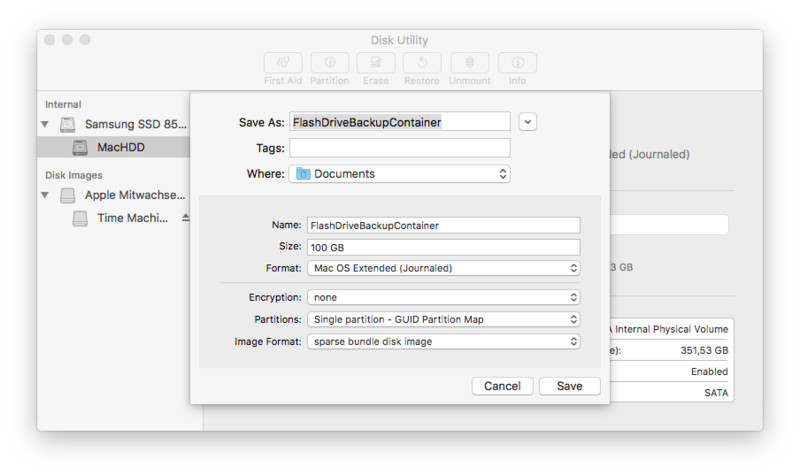 If you move the disk image later, just reselect the destination in Flash Drive Backup. Double-click the image to mount it. 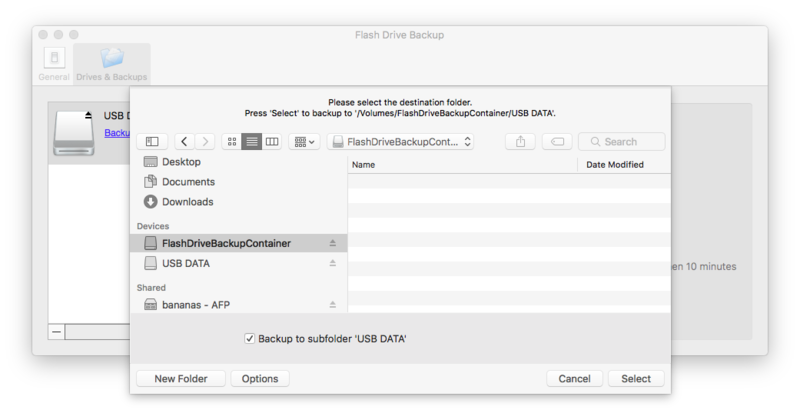 Setup a backup in Flash Drive Backup as usual and choose the mounted drive as destination. Flash Drive Backup will automatically mount the image next time. The easiest way is to use an additional tool: MacDropAny. As folder to sync use the 'backup destination folder' > 'latest' > 'the file/subfolder you want to sync'. When Flash Drive Backup makes new backups, a copy will be uploaded to your cloud service. IMPORTANT: This is an one way backup. Changes done in the cloud will not be copied back to the USB drive!